Walking is boring. Not that we endorse using automobiles as transportation over more eco-friendly methods, but there’s only so much you can do with your feet besides putting one in front of the other. Luckily there are designers like Shane Chen out there to cut through our meandering boredom. 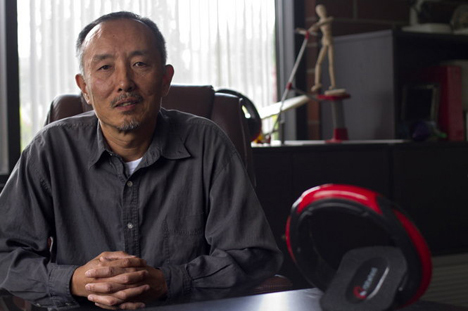 Based in Washington, Chen is a self-proclaimed “true inventor and tinkerer since he was young.” Chen’s successful background in agriculture allowed him the financial freedom to jump into the fields of personal transportation and fitness. His company Inventist has been behind his devices. 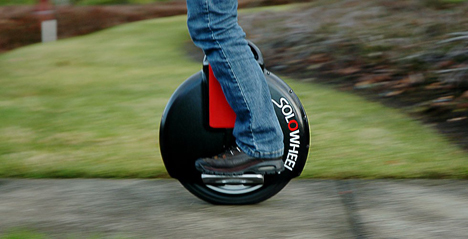 The most successful of them, the Solowheel, modestly calls itself the “smallest, greenest, most convenient ‘people mover’ ever invented.” It’s a balance-based transporter, like a Segway, but doesn’t have handlebars and is single-wheeled. Being battery powered makes it green, and it’s health benefits are prominent enough that it was featured on an episode of ‘The Doctors’ last year. For the more athletic traveler, Chen created the Orbitwheel, a combination of a skateboard and inline skates. It’s much more user-intensive, as there’s no battery to make it go, only you. The Orbitwheel is definitely something you would see people use to do inline skate-style tricks. The Hovertrax, his most recent invention, is an easier to use version of the Solowheel. As long as his imagination keeps going, short-distance transportation will never get old. See more in Home & Personal or under Gadgets. December, 2013.